The Pythagoreion and Heraion of Samos are the remains of two impressive classical architectural structures. The Pythagoreion was an ancient fortified port with Greek and Roman monuments. It holds the Tunnel of Eupalinos, of 1,036 m length and built in the sixth century BC. The tunnel is the second known tunnel in history which was excavated from both ends, and the first with a methodical approach in doing so. The Heraion of Samos was a sanctuary originating from the 8th century BCE. 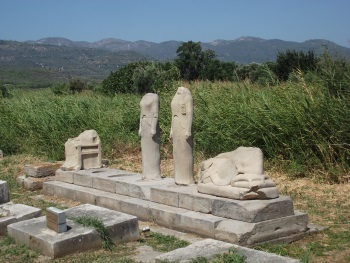 A temple stood opposite the cult altar of the goddess Hera. It was the first of the gigantic Ionic temples. Unfortunately it stood for only about a decade before it was destroyed, probably by an earthquake. After that, an even larger one was built approximately 40 m to the West. This temple has the largest known floor plan of any Greek temple. The Pythagoreion is named for the mathematician Pythagorous, whose birthplace is nearby. Other remains inbcluse the castle and Temple of Thermes, the Spiliani Monastery and the Eupalinos Tunnel (currently closed for restoration). The Heraion is named for a Temple dedicated to Hera, wife of Zeus. However this has since been overlaid by other Greek, Roman and Christian constructions, none of which appeared readily identifiable. 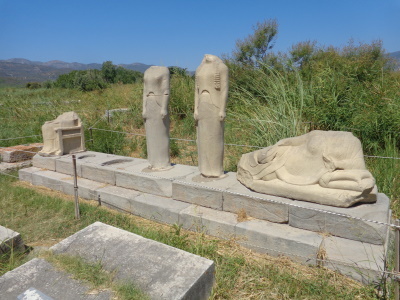 I visited Samos in August 03 with my wife and 7 year old son. Samos in general is a particularly welcoming island; the people are warm and friendly and not jaded overmuch by tourism. It is, in general a 'quiet' island, avoiding the youthful excessess currently occurring on Rhodes. This is a great island for families, especially those who like to experience breathtaking mountain scenery, beautiful bays, olive and pine groves, magnificent honey and of course, the renowned Samian wine. The site of Hera's temple, just outside of Pythagoreion and a kilometre from the coastal resort of Iraion (brimming with delightful Tavernas along the waterfront) is quite stunning. The ruins are particularly ruined! Only one column survives (and I believe that was re-erected at some previous point) but the size and grandeur of the place are unmistakeable. Open on Sunday and throughout the week, you will pay 8 euros at current prices for the priviledge of entering (about £ 5.60 sterling) which is a bit pricey for a family, but it is worth the wander around the stones. Every so often a holiday plane roars above taking you back to the 21st Century. You can grab a good photo or two through the railings if you dont want to pay the entrance fee. Take water and refreshments with you - none are to be had on site. Although a spectacular area, I felt there were others more so on other islands and in particular on the mainland. However, if your visit is not merely academic, I commend Samos to you! Sites from antiquity with identified architects: Tunnel of Eupalinos, Theodorus of Samos is the architect of the Doric Order temple Heraion of Samos.